In recent years, industry has demanded a range of materials that not only possess strength, wear properties, heat and chemical resistance but materials that are less resistive to the build-up of a static charge. Ensinger has a family of such materials; their properties are listed on the reverse side of this sheet and described below. Ensinger?s static dissipative acetal contains no carbon fibers or powders and is generally accepted for clean room use. With its surface resistivity of 109 to 1011 ohm/square and its excellent bearing and wear characteristics, TECAFORM™ SD is ideal for moving components which may experience frictional or fluid-flow static charges. A polycarbonate based material with a proprietary carbon filler component. The highly dispersed filler imparts outstanding electrical consistency to minimize any hot spots. The material has the best repeatability and predictability of any commercially available carbon based filler. HYDEL® PC7 has minimal sloughing as compared to other carbon based fillers. This material also retains much of the physical properties of polycarbonate without the loss of impact and tensile properties that can occur with standard carbon based or fiber fillers. 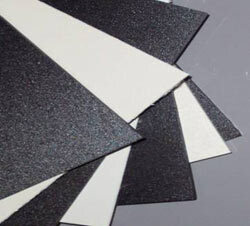 HYDEL PC-P ESD polycarbonate is a static dissipative thermoplastic product containing carbon powder. This material has good stiffness, excellent dimensional ability, and low outgassing properties. A static dissipative polyetherimide utilizing proprietary filler technology which renders this material electrically conductive. This technology allows for good dimensional stability after machining (unlike conventional carbon fibers), consistent electrical properties, excellent surface quality and minimal sloughing. It also possesses outstanding toughness and excellent thermal stability. An ultra high performance bearing material based on the PEEK polymer. Some of the wear enhancing additive also provides a high degree of static dissipation. TECAPEEK™ PVX provides high temperature use with low thermal expansion. TECASINT™ 5201 has the highest compressive strength and use temperature of the group. It is based on an Ensinger manufactured polyamide imide resin with a low sloughing, additive package. TECAFORM® SD – Ensinger Industries, Inc.